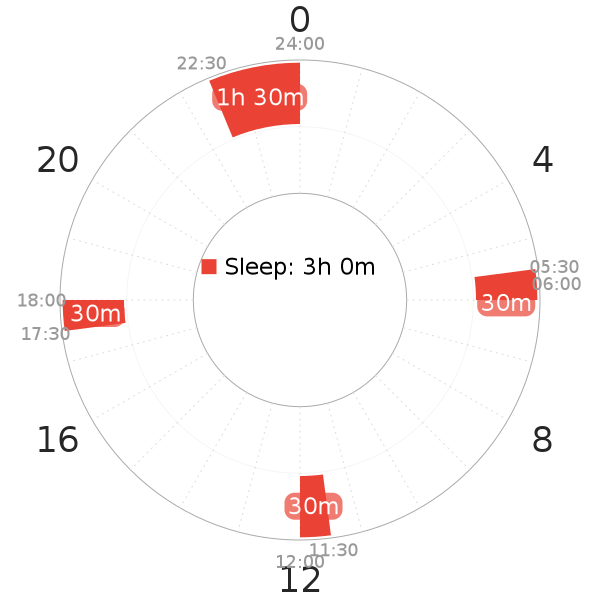 The Dymaxion sleep schedule is one of the most well-known polyphasic sleep schedules. It is made up of four equidistant 30m naps taken every 6 hours, and no cores, totalling only 2h of sleep a day. 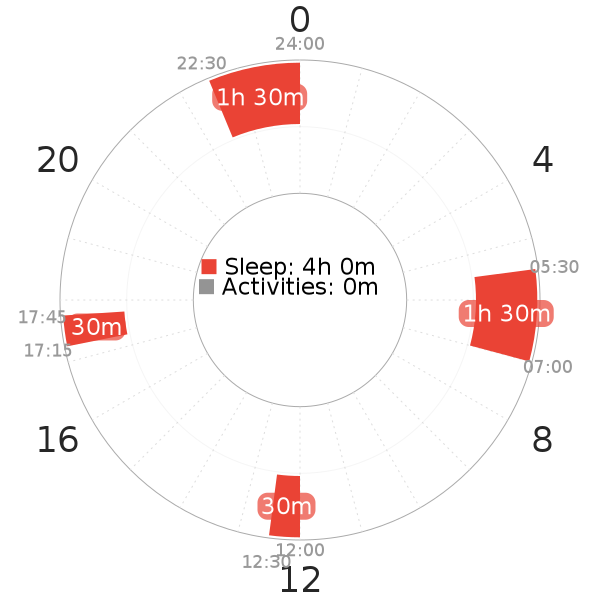 It is very likely not possible for a person with average sleep requirements to get all necessary sleep on this schedule, so chronic sleep deprivation is to be expected unless you naturally require a low amount of sleep even on a monophasic schedule. The schedule was first proposed by Buckminster Fuller in the 1930s, who reportedly slept on this schedule for most of the time between 1932 and 1933. Dymaxion stands for ‘dynamic maximum tension’ and Fuller applied this word to many other inventions of his, including a house, a car, and a map. Most things that apply to [[Uberman]] also apply to Dymaxion. 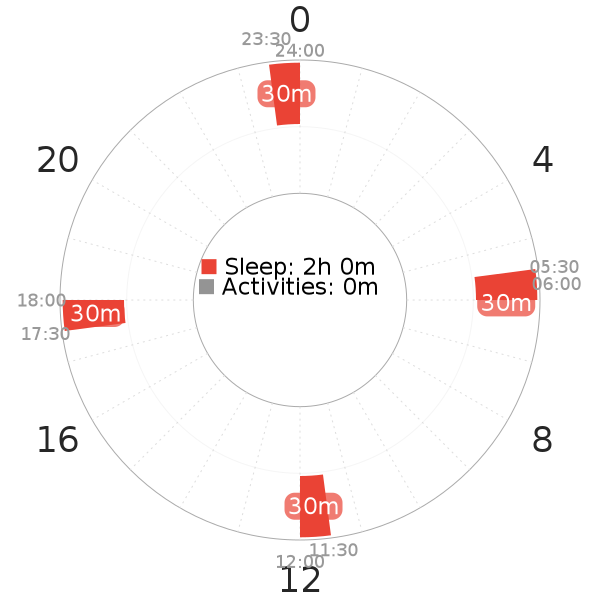 Because it is a nap-only schedule with a total of 2h of sleep time, it has a lot of similarities to Uberman, including the extremely high difficulty, miniscule success rate, insane adaptation, and basically no flexibility. Like with Uberman all of the SWS and REM must come from naps on this schedule, so the amount of SWS and REM in proportion to light sleep is very high. Dymaxion still tends to be less popular than Uberman. Difficulty-wise Dymaxion is harder than Uberman. Because of the larger gap between naps (5h30m compared to 3h40m) the wakefulness-sustaining capacity of naps is going to falter. The length of the naps is during adaptation, however, the hardest part of the schedule. SWS will usually begin at around the 25 minute mark even when the SWS pressure is low. After the first day or two every nap is going to end in SWS because the nap is long enough to cross this SWS boundary. In contrast to this, with a 20 minute nap-only schedule like Uberman the naps will contain SWS only after the SWS pressure hits a peak or when the sleep cycle to compressed enough that the naps are able to have the SWS start earlier. 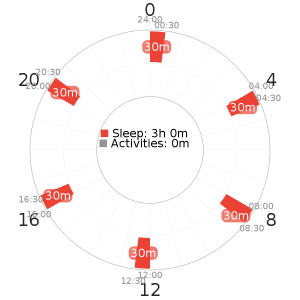 This means that nap-only schedules with 20m naps don’t get SWS wakes until some time has passed on the schedule. Even in the beginning of adaptation the naps on Dymaxion are harder to wake from than the naps on Uberman, because they all have SWS wakes. SWS wakes are associated with grogginess after wake up (sleep inertia), so waking up from every nap is going to be difficult until the body gets used to the nap length and performs wake time programming. They are also associated with a difficulty of hearing alarms, which means that even those with a high willpower are going to have a really hard time actually waking up from the naps. Finally, in SWS wakes you are very prone to immediately falling back asleep unless you stand up. Naps that end in SWS also have the disadvantage of forgetting or not having dreams when you wake up. The benefit from doing this schedule over Uberman is the larger gap between naps, which is useful for activities and other life commitments. Dymaxion has very similar rules as Uberman, and adaptation is likely going to be impossible without human supervision. These transitional gradual adaptation schedules follow the same concept as the Uberman transitional ones like E5. The end results are Dymaxion-style schedules where one or two naps are replaced with cores. Starting from Bimaxion, one core is shortened to 30m after adapting to the previous schedule until every sleep block is 30m long. This approach suffers from the same issues as the gradual adaptation to Uberman. GeneralNguyen who proposed Bimaxion, previously called the schedule Quadphasic. This was renamed to Bimaxion to help clarify naming. Dymaxion 6 is often mislabeled as Uberman, because it resembles the structure of Uberman a lot, the only difference being 30m naps instead of 20m ones. So what practically makes a difference is that the naps on Dymaxion 6 have much worse wakes than the naps on Uberman during adaptation, due to their length. At most a handful of people have been able to adapt to this variation, and it suffers from the same problems as Uberman, namely the inconvenient scheduling. It also has the same problems as other nap-only schedules, like extreme rigidity and questionable health impacts. Therefore, this schedule also can’t really be recommended for people to do long term. The reason that this schedule is classified with the INSANELY HARD difficulty rather than VERY HARD while still having 3h of total sleep time is because of the problematic SWS wakeups mentioned above.